The 'Dubai and the Northern Emirates - USA Road Show' delegation from the United Arab Emirates (U.A.E.) marked its third stop on a five-city tour of the United States with a conference in Minneapolis on Thursday. The conference was hosted by the Global Initiative at the University of Minnesota's Carlson School of Management in partnership with the U.S. Commercial Service, the National U.S.-Arab Chamber of Commerce (NUSACC), and the U.S.-U.A.E. Business Council. The event brought senior delegates from the U.A.E. together with one hundred American executives from companies in Minnesota for a day of corporate briefings, events, and networking opportunities. The USA Road Show has already visited New York City, NY, and Atlantic City, NJ, and is being led by Principal Commercial Officer at the U.S. Consulate in Dubai, Robert Bannerman. The conference was anchored by a luncheon, co-hosted by NUSACC and the U.S.-U.A.E. Business Council, in honor of the delegation. The event featured remarks from His Excellency Hisham Al Gurg, Chief Executive Officer of the Private Office of Sheikh Saeed Bin Ahmad Al Maktoum, and the Honorable Keith Ellison, Congressman from the 5th District of Minnesota in the U.S. House of Representatives. David Hamod, President and CEO of the National U.S.-Arab Chamber of Commerce (NUSACC), and Colin Rutherford, Vice President of the U.S.-U.A.E. Business Council, provided opening remarks at the lunch and emphasized the strength of the U.S.-U.A.E. economic and trade relationship, as well as the U.A.E. 's position as a regional gateway and hub for international trade and commerce. "Today's conference at the University of Minnesota provided an excellent opportunity for industry representatives from the U.S. and the U.A.E. to engage each other," said Hamod. "Minneapolis is a focal point for agribusiness, healthcare, and a wide range of service industries, all of which are of interest to the U.A.E. delegates." ​"The U.A.E. is currently America's top export destination in the Middle East North Africa (MENA) region," said Rutherford. "It is important to inform key decision-makers as well as the broader American business community about the economic strength and viability of the U.A.E as a commercial destination and key transit point to markets around the world." Following those remarks, Robert Bannerman provided the audience with a status report of the delegation's visit and underscored the U.S. Commercial Service's commitment to supporting the President's National Export Initiative to boost American exports by advancing trade ties with the U.A.E. and other countries around the globe. After his brief comments, Bannerman introduced H.E. Hisham Al Gurg for the keynote speech. "Minneapolis is an important financial center in the United States and home to several global companies expanding to emerging markets in the U.A.E., the broader Middle East region, and around the world," said Al Gurg. "Our delegation is very pleased to have the opportunity to establish connections that have unbounded potential with American business leaders -- today and throughout our trip." 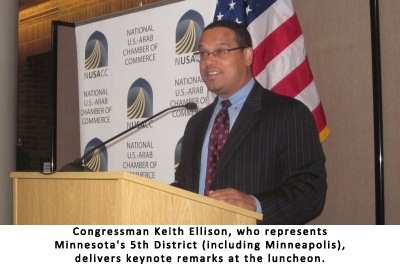 Congressman Ellison concluded the luncheon's formal program with remarks expressing the importance of global economic outreach and partnership with the U.A.E. to the local market in the metropolitan Minneapolis area and the broader United States. 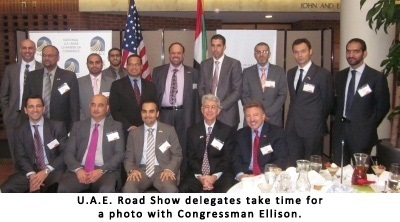 "I am very pleased that Minneapolis was one of the destinations for the Dubai and Northern Emirates Road Show," said U.S. Representative Keith Ellison. "There are many investment opportunities in Minneapolis and the Twin Cities region for the U.A.E. business community to explore. I hope that we can capitalize on these business to business gatherings to increase business development through trade promotion and foreign direct investment between our region and U.A.E." The conference opened with remarks by: Dr. Michael Houston, Associate Dean of Global Initiative at the University of Minnesota's Carson School of Management; Robert Bannerman from the U.S. Consulate in Dubai; NUSACC's David Hamod; and Colin Rutherford of the U.S.-U.A.E. Business Council. In their welcome remarks, the co-hosts welcomed the audience, introduced the delegation, and underscored the importance of Minneapolis in the context of the overall mission's objective of spreading corporate awareness of investment and partnership opportunities in the U.A.E. to key global markets around the United States. During the conference, members of the U.A.E. delegation and Talal Kaissi, Chief of Staff of the Trade & Commercial Office at the U.A.E. Embassy, sat down for a panel discussion on the corporate climate, national infrastructure, and social culture in the U.A.E. Moderated by Dr. John Pournoor, International Governments Markets Executive at 3M, the panel highlighted opportunities in the northern emirates of Dubai, Ras Al Khaimah, and Sharjah. After the formal program, Dr. Pournoor opened the floor to questions, providing an opportunity for a wide-ranging discussion about commercial and investment opportunities for American companies in the Emirates. After the morning panel, several members of the U.A.E. delegation made individual presentations to the audience highlighting their specific businesses and corporate objectives for the visit to the United States. Although delegates' presentations covered diverse economic sectors, a prevalent theme throughout the session focused on developing long-term partnerships and exploring training opportunities with American firms and institutions. After the luncheon, the delegation attended targeted meetings and business-to-business matchmaking sessions. On Friday morning, the delegation will finish the Minnesota leg of the mission with a site visit to the 3M Innovation Center in St. Paul. The Minneapolis/St. Paul area is home to numerous business sectors, including agribusiness & food services, banking & financial services, health care services, and retail. Located on the banks of the Mississippi River, the Minneapolis/St. Paul area is the sixteenth largest metropolitan area in the United States, serving as an economic bridge between the Midwest and the West Coast. The two cities, known as the "Twin Cities," are renowned for the Chain of Lakes system. Some of the leading companies with headquarters in Minneapolis/St. Paul include Ameriprise Financial, Best Buy, CHS, General Mills, Land O'Lakes, Medtronic, Target, Thrivent, UnitedHealth Group, U.S. Bancorp, Xcel Energy, and 3M. The 'Dubai & the Northern Emirates - USA Road Show' is organized by the Commercial Service at the U.S. Consulate in Dubai in partnership with the National U.S.-Arab Chamber of Commerce (NUSACC) and the U.S.-U.A.E. Business Council and is supported by the Trade & Commercial Office at the Embassy of the U.A.E. in Washington, D.C. After Minnesota, the delegation will travel to Seattle and Dallas/Fort Worth before returning to the United Arab Emirates next week. The U.S. Commercial Service is the trade promotion arm of the U.S. Department of Commerce's International Trade Administration. U.S. Commercial Service trade professionals in over 100 U.S. cities and in more than 75 countries help U.S. companies get started in exporting or increase sales to new global markets. The National U.S.-Arab Chamber of Commerce (NUSACC), established over 40 years ago, is America's longest serving organization dedicated to U.S.-Arab business. NUSACC is widely regarded as the voice of American business in the Arab world and the premier private sector portal to the United States for Arab commercial enterprises. The National U.S.-Arab Chamber of Commerce is the only business entity in the United States that is officially recognized and sanctioned by the League of Arab States and the General Union of Arab Chambers of Commerce, Industry, and Agriculture. As such, NUSACC is a "sister chamber" and partner to the national chambers of commerce throughout the Arab world. With offices in New York, Houston, Los Angeles, Salt Lake City, and its headquarters in Washington DC, NUSACC is the only chamber of its kind to provide "coast-to-coast" service. This nationwide coverage means that NUSACC is well positioned to serve its members in all 50 States and to provide outreach capabilities to all of America's major markets. The U.S.-U.A.E. Business Council is a progressive business advocacy organization solely committed to the advancement of the trade and commercial relationship between the United States and the United Arab Emirates. The Business Council actively works to ensure that the U.S. and U.A.E. remain attractive destinations for foreign direct investment by conducting effective policy advocacy, undertaking various trade promotion initiatives, providing ongoing updates on the business climate in both countries, and helping develop strategic relationships between U.S. and U.A.E. business and government officials.